United India Insurance Company Limited will conduct Asst. Main exam in the first week of January 2015. UIIC had invited online applications for 684 Asst. posts. The written test for these posts is scheduled to be held through online mode. So the insurance company is going to release their admit card for these posts. Those candidates who had applied, can download their UIIC Assistant Exam Admit Card 2014 from the direct link given below. Candidates have to bring their UIIC Assistant 2014 Admit Card at the time of exam as it is mandatory to enter the exam hall. All the details like exam centre, time and duration of test, roll number etc. will be mentioned on the admit card. Candidates need to check them carefully. 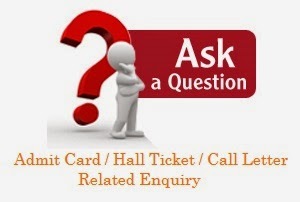 They are required to bring this admit card at the time of test to be conducted. visit UIIC admit card download page at direct link provided here. Then candidates need to select the language of admit card. Enter your registration number and date of birth in the field provided and click on submit. Their UIIC Assistant Admit card 2014 will be shown to them. Candidates have to take a print of it by clicking on print button provided. After printing, they should follow all the instructions given on it and follow them accordingly. United India Insurance Company Limited is a public sector General Insurance Company of India, founded in 1938. It is one of the top General Insurers in Asia and has more than 70+ years of experience in Non-life Insurance business. It conducts various recruitment exams every year. Now it is going to conduct written exam for Asst. posts for which admit cards are going to be released.